BEIJING, Aug. 31,Chinese President Xi Jinping met with Somali President Mohamed Abdullahi Mohamed on Friday ahead of the 2018 Beijing Summit of the Forum on China-Africa Cooperation (FOCAC). 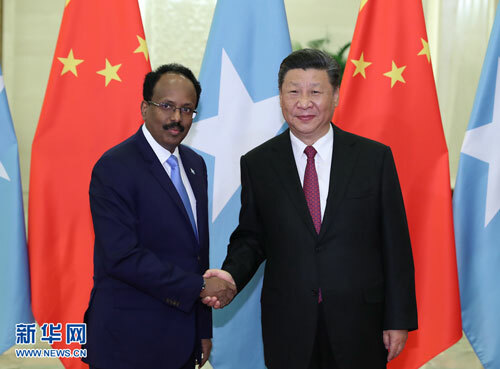 Noting the long tradition of China-Somalia friendship, Xi said Somalia was the first East African country to establish diplomatic ties with the People's Republic of China (PRC) and one of the countries proposing to restore the PRC's lawful seat in the United Nations. China congratulates Somalia on the new progress in its peaceful reconstruction and will continue to support the Somali government in advancing its political agenda, promoting social reconciliation and enhancing governance capability, Xi said. China supports Somalia's efforts in safeguarding sovereignty, security and territorial integrity, he said. Xi called on both sides to strengthen cooperation within the framework of the Belt and Road Initiative, FOCAC, and the China-Arab States Cooperation Forum. For his part, Mohamed expressed the gratitude of the Somali government and its people for China's long-time support, their admiration of China's achievement in reform and opening-up, as well as the desire to learn from China's development experience. Somalia firmly sticks to the one-China policy and actively participates in the Belt and Road cooperation. The country would join hands with China to build a China-Africa community with a shared future within the framework of the FOCAC, he said. After the meeting, the two presidents witnessed the signing of agreements on bilateral cooperation in the Belt and Road construction and other fields.